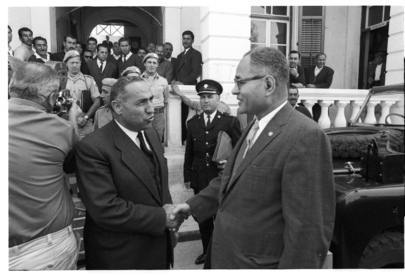 Mr. Ralph J. Bunche, Under-Secretary for Special Political Affairs, visited Cyprus in the course of routine visits to Gaza, Cyprus and Kashmir to study the problems and needs of the United Nations truce supervision and peace force operations in these areas. The missions include the United Nations Emergency Force (UNEF), the United Nations Force in Cyprus (UNFICYP) and the United Nations Military Observer Group in India and Pakistan (UNMOGIP). Mr. Bunche (foreground, right) bids farewell to Mr. Zenon Nryonides (left), at the Cypriot District Office of Ktima. Lieutenant-General Prem Singh Gyani, Commander of UNFICYP, is directly behind Mr. Nryonides.